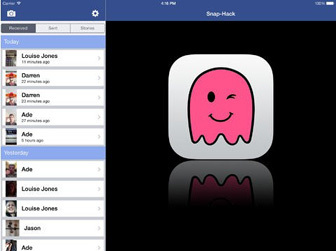 Snap-Hack Pro for Snapchat is a photo and video sharing software. If you see anything like the photos or videos on SnapHack, the app can automatically save it, all you need just an one click, you can put your favorite photos or videos and sent them to the Internet in order to find friends who have the same hobbies with you. Log into Snap-Hack™ with your Snapchat credentials and it will download any images and videos that you haven’t yet opened in Snapchat. When you get a Snapchat notification or see that you have new snaps, simply open Snap-Hack™ first, pull down to refresh, and it will grab your new snaps. – Supports both photos and videos. – Save received photos and videos to your camera roll/photo album so you can back them up and share them. – Forward photo’s and video’s to your other Snapchat friends. – Forward your snaps via email. – Post your received photo’s on Facebook & Twitter. – The other user will never know you saved the message. – Send your own snaps, even from your camera roll/photo album. – Post snaps to your story. – Add stickers and draw on your snaps, or send edited snaps back to others. NOTE: Once you have viewed a snap in the official Snapchat app, it is deleted forever, so be sure to open them in Snap-Hack™ first.